Police in the UK say they have disrupted a plot to blow up planes flying from the UK to the US. Among the measures being put in place in response, the US Homeland Security chief Michael Chertoff has announced that additional air marshals will be sent to the UK to provide extra security on flights to the US. We examine what air marshals do and explore the issues surrounding their deployment. An air marshal is an undercover armed guard on board a commercial aircraft, to counter hijackings and other hostile acts. US marshal training includes marksmanship, intimidation tactics and emergency procedures, according to the US Department for Homeland Security. The guards, who usually work in teams of at least two, enter the plane before the other passengers. They keep a watchful eye on the other passengers, but try to maintain a low-key profile. In the event of an imminent threat from a passenger, air marshals say they are trained to respond with lethal force. But marshals also contribute to security in quieter ways, for example by logging examples of suspicious passenger behaviour. What are the details of the UK deployment? The Department for Homeland Security refuses to say how many marshals are being deployed to the UK. They did say Mr Chertoff's announcement described a redeployment of personnel, not new staff, as substantial training is required. What is the US policy on air marshals? 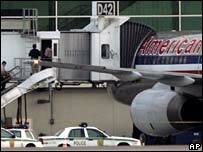 There were 33 federal air marshals at the time of the 2001 attacks. Numbers were dramatically increased after the attacks, and the Department for Homeland Security now says there are "more than a thousand", but the exact number is classified information. The programme began in 1968 and was expanded in 1985. The Federal Air Marshals Service (FAMS) is now part of the Department of Homeland Security. It is in line to receive $700m (£367m) in funding in the 2007 fiscal year (up from just $4.4m in 2001). In late 2003 the US said international flights to or over the country would be required to carry armed guards in certain cases. Washington said flights could be banned if airlines refused to comply. The demand prompted concerns over safety and cost from some carriers. Some were worried that a firearm carried by a sky marshal could be used against the aircraft or its crew. How many other nations use air marshals - and what is their record? Israel's El Al has had armed marshals operating on its flights for more than 30 years. A minority of other countries hase also introduced armed guards on board, including Germany, Canada and Australia. In the 1970s a team managed to overpower hijackers on an El Al flight from Amsterdam to New York by warning the pilot, who put the plane into a steep dive, throwing the attackers off their feet. In 2002 El Al guards arrested a man with a knife who appeared to be storming a cockpit. Also in 2002, two hijackers on an Ethiopian airline flight were shot. In late 2005, Rigoberto Alpizar was shot dead by air marshals at Miami International Airport after claiming to have a bomb - the first time a US air marshal had shot someone dead since 9/11. In June, the European Parliament toughened restrictions on the use of air marshals, requiring that must now be granted permission from the country granting each airline's operating licence, and the countries of departure and arrival. Are any guns safe on aircraft? There will always be the risk of injury, but proponents of air marshals argue the level of risk is manageable. There is the potential for gunshots to penetrate the cabin walls, but this is unlikely to lead to serious cabin decompression. Air marshals are trained to avoid hitting critical systems, but this remains a risk. The type of ammunition used is also important. "Frangible" bullets - which break up on impact and thus minimise the risk of bullets exiting the target and continuing on to damage the aircraft - seemed to be ideal but a recent US congressional report suggested that following outside testing they are no longer in use. A gunfight on a passenger airliner is seen as an option only of last resort. Are there other problems associated with using US air marshals? There have been reports about morale problems within the marshal service since late 2004, and in a recently reported memo to agents, the head of the service Dana Brown promised to review the way the service is run. Marshals still complain about being forced to adhere to a formal dress policy which makes them stand out from fellow passengers, despite attempts to adjust this policy last year. Other complain that they are made to display their credentials prior to boarding. Some air marshals also allege that pay raises, bonuses and performance appraisals are linked to submitting regular reports on suspicious passenger behaviour. They complain linking such reports to pay and other benefits undermines the credibility of such reports, and risks resulting in passengers' names being put on watch lists without due standards of proof. But chiefs deny there is any "quota" system for such reports. What do pilots think about hosting air marshals? There has been some controversy over the introduction of air marshals onto flights. In 2003, the British Airline Pilots' Association threatened to strike over the introduction of marshals, saying "we don't believe that guns and air travel mix". They were also unhappy about marshals travelling on planes without pilots' knowledge. French pilots were also said to be unhappy. But air marshals are not the only ones carrying weapons. In December 2005, John Mica, chairman of the US House of Representatives aviation subcommittee, was quoted as saying many pilots had now been certified to carry weapons, and that armed pilots now outnumbered air marshals. What is the consensus among security experts on air marshals? Experts in general say there is nothing wrong with them in principle, but that other security measures are more important. Security is a chain stretching from the point where passengers arrive at the airport, to the point where they leave at their destination. Stopping a potential attacker before they board the plane is the priority, though many experts believe air marshals are an important last line of defence.